Logitech introduced the Logi BASE Charging Stand with Smart Connector, for the 12.9-inch or 9.7-inch iPad Pro models, another way to make the most out of Apple’s Smart Connector on the iPad Pro. A first of its kind, Logi BASE that gives you the perfect viewing angle for enjoying apps and entertainment in every room. It can be utilized to allow the tablet to be displayed in various locations like at a desk, on a nightstand or even at the kitchen counter for those recipe copies. As for the dock itself, it sports a rubber bottom that will hold the tablet firmly in place. Right in that area are the 3 Smart Connector pins that will be used to send precious juice to the Apple device, but because of the position of prongs, the orientation will be limited to landscape. At the back of the accessory is where the lightning connector port will be placed dead center. This goes without saying, but that’s how it’s powered up. Logi BASE belongs with your iPad Pro Model. From the high-grade aluminum to the premium finish and curved shape, every detail is designed to complement the iPad Pro, and enable it a pleasure to look at and use. 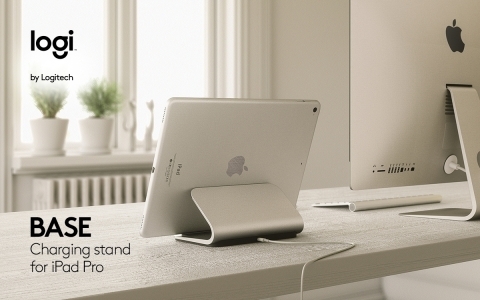 Nonetheless, the Logi Base chaging connector offers a sturdy stand and an upright viewing angle which is suitable for using the iPad Pro as a second screen or as a device for watching videos or other media app. The accessory also has a Lightning port located at its back to house a Lightning cable, which is used to power the connector. This iphone charging base, Logi BASE is compatible with the 12.9-inch and 9.7-inch iPad Pro and is available from Apple and Logitech for a suggested retail price of $99.99.